Solutions to Sat Physics subject questions on uniform circular motion with detailed explanations. Fig. 1 below is related to questions 1, 2 and 3. Fig1. - Uniform Circular Motion. Fig.1 above refer to a point moving along a circular path. What is the direction of the velocity of the moving point at A? 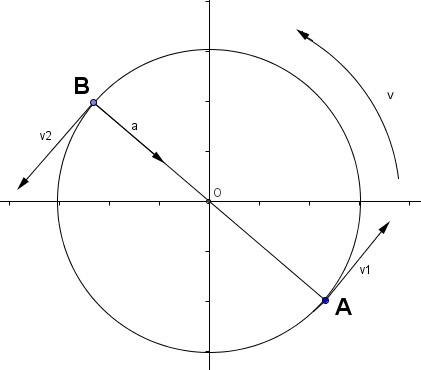 The direction is that of a tangent vector v1 at A pointing in the direction of motion as shown in the figure below. Fig.1 above refer to a point moving along a circular path. What is the direction of the centripetal acceleration at point B? 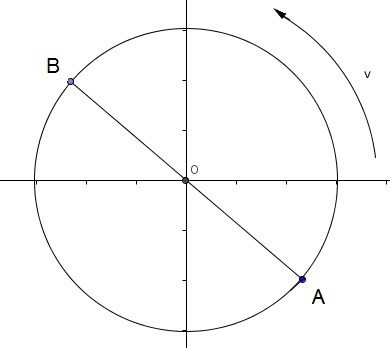 The centripetal acceleration is vector a perpendicular to the (vector) velocity at point B and directed towards the center of the circle of rotation as shown in fig.2 above. Again referring to fig.2 above, the velocities v1 at A and v2 at B have equal magnitude since the speed of the moving object is uniform and opposite direction since vectors v1 and v2 are both perpendicular to AB but directed towards the direction of rotation. In a uniform circular motion, which of the following is constant? By definition, in a uniform circular motion the speed is constant. F is the centripetal force of a sphere rotating along a circular path at speed s. The mass of the sphere is m and is at distance R from the center. What is the centripetal force of the same sphere if the distance R is doubled? a is the centripetal acceleration of a sphere rotating along a circular path at speed s. The sphere is at distance R from the center. What is the centripetal acceleration of the same sphere if both distance R and speed s are doubled? What is the ratio s1 / s2 where s1 and s2 are the speeds of two satellites placed in stable circular orbits of radius R and 2R respectively? where m is the mass of the satellite, s is the speed of the satellite, M the mass of the earth, R is the radius of the orbit and G is a constant. What is the centripetal force acting on a car of mass 2000 Kg turning around a circular bend of radius 50 meters at the constant speed of 36 km/hr? What is the period of a point moving along a circular path of radius 5 cm at the linear speed of 200π cm / minutes? The period is the time taken for one whole rotation of the point around the circular path. A car is being driven on a road having two distant circular bends B1 and B2 of radius R and 3R respectively. If s1 is the speed of the car at the bend B1 and s2 is the speed at the bend B2, what should the ratio s1/s2 be so that the centripetal forces at both bends are equal?